Varnishes and paints used by professional cabinet makers could cause fires and serious injuries without proper explosion proof equipment. An example of such occurrences comes from Elgin, Illinois. Imelda Villagomez and Victor Contreras, a couple working on a DIY project in their basement, was engulfed in flames after fumes from a varnish and lacquer thinner that were applied on the flooring of the room suddenly ignited. The source of the combustion was traced to a pilot light inside the furnace. Cabinet makers work with varnish on a regular basis to decorate or finish their offerings. Varnish is a synthetic liquid derived from a combination of drying oil, such as linseed oil, tung oil or modified soybean oil, and resin, such as polyurethane, alkyd or phenolic. Both components are “cooked” together to form a cohesive compound. It is typically applied to surfaces to form a protective layer, making the final product stronger and highly resistant to minor abrasion (usually from dirt, sunlight or water). In some cases, varnish refers to wood stains or sealants that do not cover the grain of the surface. When applied properly, it can preserve the natural look and feel of wood. Paint fumes that contain the following products are considered flammable and potentially explosive: alcohol, aromatic hydrocarbons, petroleum distillates, acetates or turpentine. This also includes oil-based paints, varnishes and oil stains. Industrial cabinet makers work with large amounts of paint and varnishes every day. Some use spray-painting methods, which can result in even, consistent finishes. The technique increases the concentration of flammable compounds in the air during application. All it takes is a small spark to ignite volatile compounds present in the facility. Sparks can come from electrical appliances and devices, such as lights, switches and fans. Static electricity generated from nylon or plastic coverings may also interact with combustible vapors in the hazardous location. In order to prevent the combustion of flammable compounds in paints and varnishes, businesses must use Class 1 Division 1 (C1D1) explosion proof lights and appliances. Class 1 hazardous locations include areas where flammable gases, flammable liquid-produced vapors, or combustible liquid-produced vapors may be present in amounts that could produce an explosion or ignition. To prevent accidental ignition, cabinet makers are required to utilize equipment that minimizes the creation of spark or provide sources of ignition. Electrical devices may either be intrinsically safe or explosion proof, while hand tools must be manufactured from non-sparking material, such as wood, rubber or plastic. In addition to cabinet-making facilities, C1D1 locations include petroleum refineries and gas stations. C1D1 explosion proof equipment for cabinet makers vary greatly. Explosion proof lights are the most common types of C1D1 equipment used for projects that incorporate painting and varnishing. 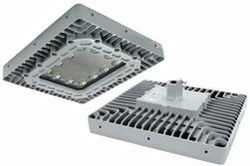 Such fixtures can be mounted overhead (explosion proof tube lamps) or used in a portable, handheld manner (explosion proof flashlights and droplights). To support electrical devices in the facility, operators may rely on explosion proof cord reels. The accessory can be used to increase the range of spray-painting appliances and remote work stations. Explosion proof extension cords, coupled with explosion proof plugs, may reduce the risk of tripping over lengthy or short wires, which could initiate the creation of sparks. This is highly applicable for facilities with limited space (explosion proof extension cords must be connected to hazardous location appliances outside of the applicable hazardous location before usage). Explosion proof fans and blowers are essential components to a cabinet maker’s work station. The units actively clean the air by getting rid of flammable, toxic fumes from paints and varnishes. Explosion proof ventilators and blowers remove stale air from the hazardous location, and work with respirators to bring clean air into the facility. The combination streamlines clean air circulation in the area, while discouraging combustible compounds from building up in the room. In hazardous locations, communication is crucial in promoting safety. Unfortunately, most conventional mobile phones are not explosion proof, and could easily ignite stray vapors and gases. A solution to this issue is the application of explosion proof phones, intercoms and signal units. The devices function like traditional communication electronics, and support special housings that contain and mitigate the production of sparks.